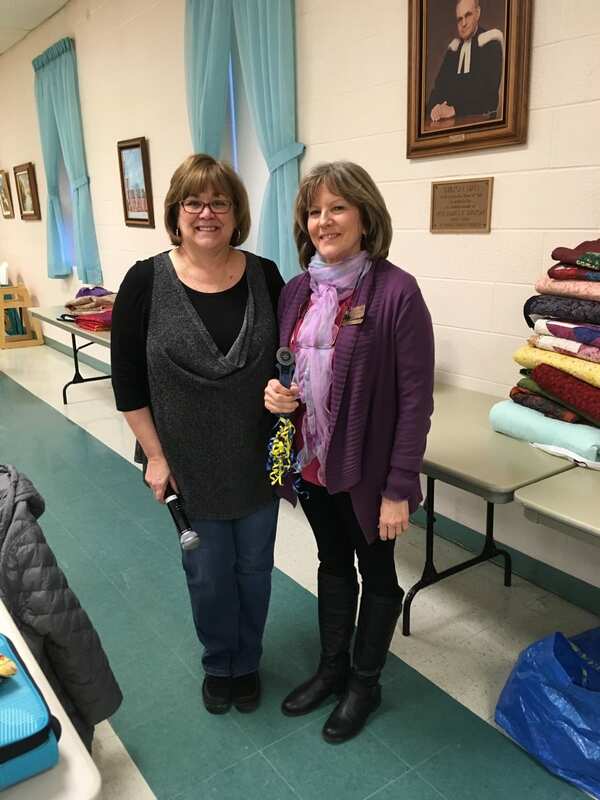 At our Annual General Meeting on a March 12th Cathy D accepted the guild’s blue & yellow rotary cutter and rule book from Cheryl D signaling the change over of Guild President, and the start of our 13th year as a guild. 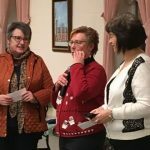 Thank you to Dianne W for volunteering to return to executive as Vice President, and Judy C for her contributions to executive as she has completed her term. 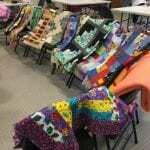 Well another successful Sit n Sew has past with 15 guild members in attendance. Much of the day’s work focused on creating Christmas Stockings. Twenty-one stockings were made, adding to a total of 32 completed at this point. So keep those stockings coming for our December 4th donation to My Sister’s Place. Thanks to everyone for coming out and having another productive day of sewing, socializing and snacking. We hope that you will find this a fun challenge and we look forward to seeing how many of our guilds will be represented in Ottawa. A number of tops went home with folks to finish up! A productive day for all, with lots of goodies and laughs. Thank you to everyone for their contributions, always. Another full meeting was enjoyed by guests and members. Our guest presenter provided a look back in time at textile comforts; sharing her collection and expertise. Our guild executive will continue for another year with many things in the works for program. – 3 bags of donated batting. 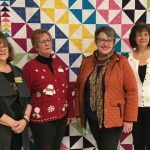 – 3 kits to make quilt tops. 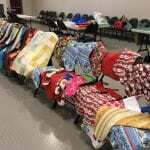 We currently have 15 completed quilts of comfort for Christmas in July. 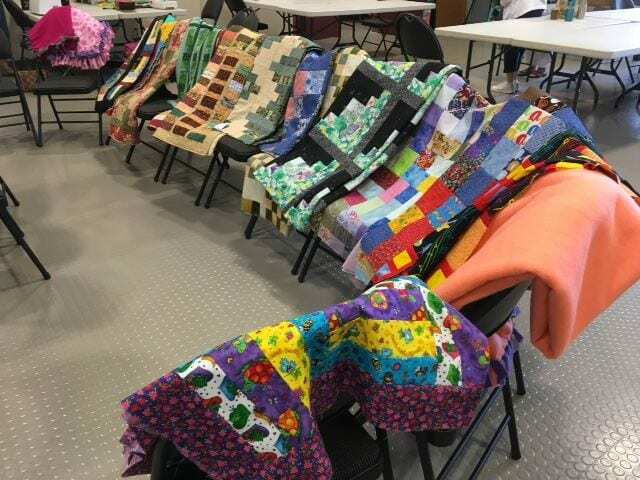 Also, progress is moving forward completing the ten quilts of comfort for Mathews House Hospice for their Spring opening. Thanks to everyone for their ongoing contributions toward our community. 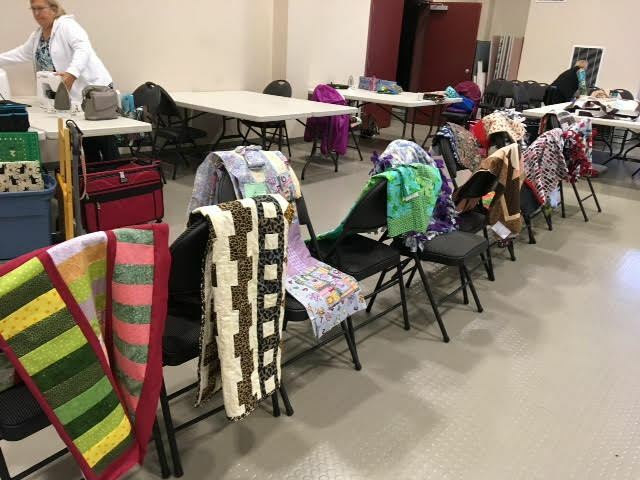 June Chambers Tuesday March 6, 2018 Quilt’s & Other Comforts. Medallion Skill Builder Begins – Donna will guide members throughout the project beginning with the center medallion in February. a materials list will be password protected under “Program” on this website followed by monthly instructions. 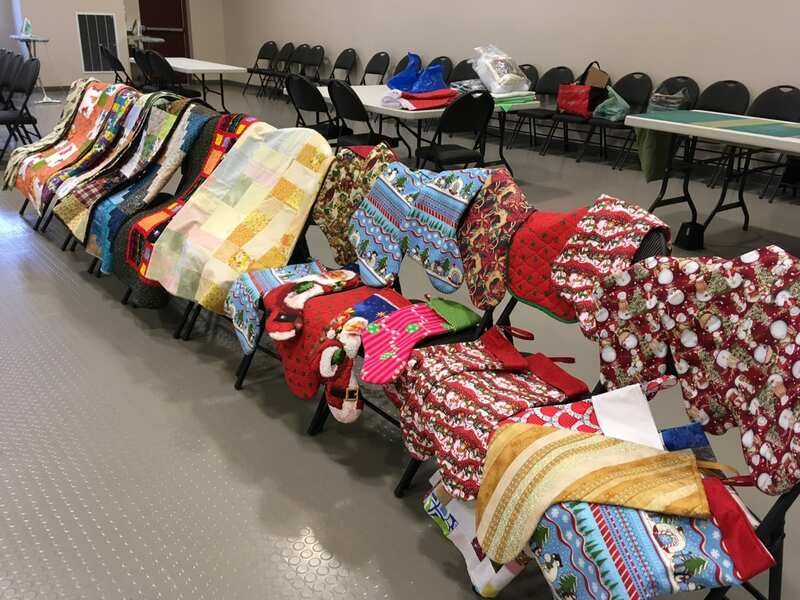 A delicious potluck, QUILT-O, community outreach, the Medallion Skill builder project and Show n Tell were the highlights of our Christmas meeting. 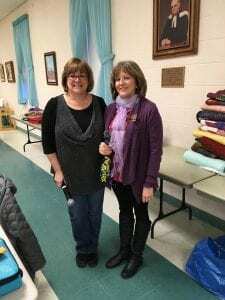 Cheryl Dobo: QCG President, Senora Baldry: QCG Community Outreach, Kim Woodland: Matthews House, and Sheila Cormier:My Sister’s Place in front of our raffle quilt. Presenting the cheques to Matthews House and My Sister’s Place. 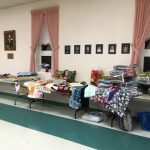 Sixty-three Quilts of Comfort, numerous hats, scarves, pillow cases, Santa Sacks and Stockings were donated to My Sisters Place. Also, proceeds from our quilt raffle were presented to MSP and Matthew’s House, each receiving a cheque for $500. The lucky winner of our beautiful quilt raffle was Carina Randell from Everett! Congratulations Carina! Wishing all our members and their families a safe and joyous festive season. 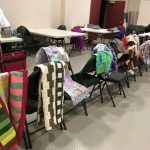 The next Sit n Sew will be in the Spring of 2018. We will post the date once it has been confirmed. Thanks to everyone for their participation, and help with set up and clean up.